Your face tells the story of your life but what story is your acne telling? And, is it possible to figure out the cause of acne from where it is on your face? Most of the time your acne is caused by a build of oil that clogs your pores and causes a spot to sprout up. However some recurring spots could be a sign of an underlying cause in your body. Please note – this is not a proven diagnosis and you must see your doctor to treat or diagnose any conditions that you may have. Causes of Acne: Does It Matter Where Your Acne Is? If you have acne on different areas of your face this can then be related to some issues in different parts of your body which we’ll discuss below. It can also have an impact on which acne treatment will work best for you. So, what does having acne on different areas of your face mean? The most common acne is typically on your chin and this is usually caused by hormones, this tends to flare up every month depending on your cycle. Acne on the lower side of face next to your chin and mouth (the jowl area), is also a hormonal issue. This typically is something to do with ovaries and a woman’s monthly cycle. It is important to notice when this acne is reoccurring or if the acne consistently there. Prominent acne here could be a sign of Polycystic Ovarian Syndrome or other conditions such as Endometriosis. Acne on the forehead can often be a sign of digestive or bladder problems. It can also be caused by the hair products we are using! Have a look at the sprays or gels you are using – they may be too strong for your skin or could be full of sulphates which are damaging your skin and causing bacteria. Acne between your eyebrows can be caused by problems with your liver. Think of when you have been out at the weekend – is your skin in a bad state after it? 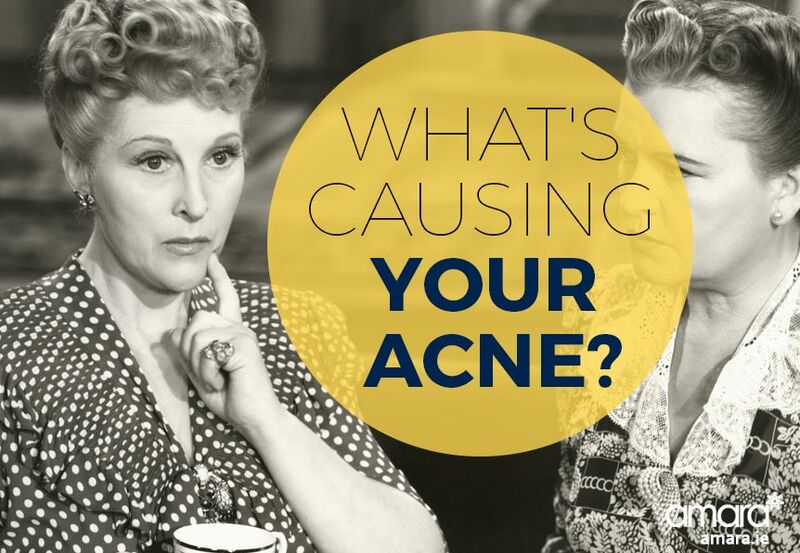 Where does your acne tend to appear? Redness or pimples on your ears are usually a sign of problems with your kidneys! This could be a sign that you are dehydrated and should be drinking more water. Acne or problems with the nose is typically found in men. A red nose or slightly bulbous nose could be a sign of rosacea. Acne here could also be a sign of high blood pressure – watch out for foods with a high salt intake. Though we tend not to get acne around the eyes, dark circles aren’t just because you’re tired! Prominent dark circles can be a symptom of something with your kidneys – drinking more water again should usually help. We often neglect our neck and chest when it comes to our skin care routine however as we get older it seems to become one of main issues! Pigmentation on our neck can actually be a sign of stress as well as sun damage! Don’t neglect your neck when applying your daily SPF – it could save you years in the long run. If you’ve checked out our Acne Bible which talks about some of the causes of acne then you’ll know some of the usual culprits but there are some surprising causes of acne to be aware of too! Check them out below. We are finding out more and more just how bad our phones are for us – from causing smart phone face to premature ageing and bad posture it’s clear our phone is not our friend! However our phones are covered in bacteria which we then press right onto our face when we take a call. This bacteria is causing acne on our faces! Clean your phone regularly with antibacterial wipes or something similar to prevent the spread of germs. In our everyday life our hands touch hundreds of things that are full of bacteria! When we touch our face we pass this on! It is important to consistently wash our hands or use hand sanitizer to prevent the spread. As well as hair products your hair can pass bacteria onto your face. Try keeping your hair out of your face to prevent the spread and if you have a fringe ensure it is regularly washed. No surprise with this one! When you leave makeup to build up on your brushes you are letting bacteria build up – it will also damage the brushes and ruin your make up application. Check our guide on how to clean your makeup brushes here. If you suffer with acne but want to make a change and finally get it under control then get in touch with us to arrange a consultation. Our skin care specialist will be able to determine what is the root cause of your acne and then prescribe a treatment plan for you to help you treat your acne.